UPDATE: The original host for the wiki had advertising that some found intrusive, and was unreliable. The wiki has been moved to wikieducator, which is a friendly neighbourhood, with related content material. This is the third, and last in a series of posts about the Parliamentary Inquiry into 21st century learning environments and digital literacy. I was thinking how a national discussion on the topic, which I think is critical to our social, economic and cultural future, could be encouraged. Exchanges of views on blog posts, emails and discussions lists are all useful in their own way, but they are all transient. Then I realised that a wiki is the ideal tool to build discussion and gather views on the report - the importance and priority of different recommendations, the timing and progress that is being made, and the gathering of input from the wide range of stakeholders that have an interest. So I took the report, and placed it on a wiki here. 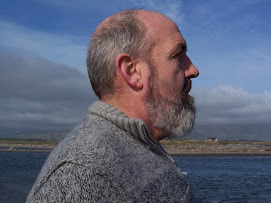 ** I chose mediawiki because it is familiar to people through their use of wikipedia. I have protected the pages that contain the actual content of the report, to maintain the integrity of the document tabled in Parliament. 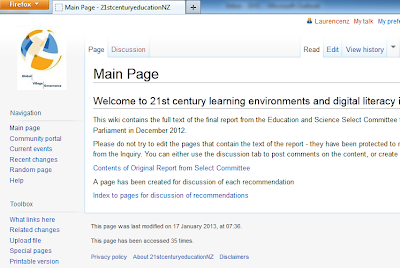 Each chapter of the report is on a separate page, and the discussion tab can be used to gather ideas and comments. I guess this is a bit of an experiment in education policy development for New Zealand, which could become a focal point for discussion on the impact of the digital world on our education system; maybe it could be the base of a project for a school in 2013? ** I chose to use a free hosting service, and it worked fine while I put the pages together, but appears to be down at the moment, so if you do not connect straight away, please keep trying.